As a veteran photojournalist in Nashville, Tennessee, I was hired by USA Today newspaper to photograph a spina bifida corrective surgical procedure. It was to be performed on a twenty-one week old fetus in utero at Vanderbilt University Medical Center. At that time, in 1999, twenty-one weeks in utero was the earliest that the surgical team would consider for surgery. The worst possible outcome would be that the surgery would cause premature delivery, and no child born earlier than twenty-three weeks had survived. The tension could be felt in the operating room as the surgery began. A typical C-section incision was made to access the uterus, which was then lifted out and laid at the junction of the mother’s thighs. The entire procedure would take place within the uterus, and no part of the child was to breach the surgical opening. During the procedure, the position of the fetus was adjusted by gently manipulating the outside of the uterus. The entire surgical procedure on the child was completed in 1 hour and thirteen minutes. When it was over, the surgical team breathed a sigh of relief, as did I. A doctor asked me what speed of film I was using, out of the corner of my eye I saw the uterus shake, but no one’s hands were near it. It was shaking from within. Suddenly, an entire arm thrust out of the opening, then pulled back until just a little hand was showing. The doctor reached over and lifted the hand, which reacted and squeezed the doctor’s finger. As if testing for strength, the doctor shook the tiny fist. Samuel held firm. I took the picture! Wow! It happened so fast that the nurse standing next to me asked, “What happened?” “The child reached out,” I said. “Oh. They do that all the time,” she responded. The surgical opening to the uterus was closed and the uterus was then put back into the mother and the C-section opening was closed. I mainly freelanced for The Tennessean Newspaper in Nashville. They recommended me when USA Today called them needing someone to photograph the surgery. I was honored to be shooting for USA Today and wanted to do the best job possible. I never imagined the child could possibly reach out during the surgery. But that is exactly what happened. As I write this nearly twelve years later I’m still in shock that Samuel reached out like he did. But I am also in shock as to what has become of the moment I captured. USA Today and The Tennessean Newspaper both published the picture initially September 7th, 1999. With my cutline stating Samuel reached out on his own. I called John Howser, Head of P.R. at Vanderbilt, seven days after the picture published in the Tennessean Newspaper, and in USA Today. “What are you talking about, John?” I asked. He proceeded to tell me that Life Magazine planned and posed a very similar picture one month before I captured the picture of Samuel reaching out. I asked John how old their baby was. “24 weeks,” he replied. I said to John, “Surely Life Magazine would rather have the real thing rather than a posed picture.” John did not seem happy with me. “I’m sorry I have offended Dr. Bruner,” I said. Susan said, “not at all, I just found out you scooped Life Magazine.” I paused a minute and let that sink in. I then told her that I could not afford to pay for it myself, and said I was sorry. I pondered the information I had and realized the position I was in. I knew about the Life Magazine picture, and story for their December 1999 issue. I knew their baby was 24 weeks and their picture was posed. After three days of pacing the floor trying to decide whether or not to use this inside information, I tried to call a photo editor at Life Magazine. No one returned my call. I decided to call Gamma Liason, a picture agency, and have them get in touch with Life Magazine for me. When I called Gamma Liason I talked to Brian Felber. I tried to explain about my picture but he didn’t understand, so I told him to show this picture to Life Magazine and you won’t have to say anything. I sent him a small digital file of the picture to show Life Magazine. Mr. Felber called me back and said, “They do want to buy your picture. They want to buy it to kill it.” His exact words. “Bad choice of words, there isn’t enough money in the world that would allow that to happen,” I said. I told Brian to tell Life Magazine that if they did not use my picture I would find an agent to aggressively market my picture, and the story about in utero fetal surgery would be old news by the time their December issue could hit the streets. Brian negotiated with Life Magazine for rights to my picture for the next four days. The second day of negotiations, I was talking to Brian on the phone, and I told him that I knew the baby in the Life Magazine picture was 24 weeks, and Samuel was 21 weeks, the youngest even considered for the surgery. I could hear a woman scream on another line when Brian told her that. He must have had a phone at each ear. I asked Brian who I was negotiating with? “Vivette Porges, a photo editor at Life Magazine,” he responded. I knew when Brian asked me,”They want to know what speed of film the picture is on?” They were actually considering using the picture. Now it was a race to have my picture published before the December Issue of Life Magazine could come out. It was nearing the third week in September 1999. I listened to the advice of a man I respect very much and hired Marcel Saba to represent the picture for me. He was owner of Saba Press, a very reputable New York picture agency. Marcel Saba worked quickly. A four page layout of my pictures from the surgery were first published in the French magazine called VSD, September-October issue, 1999. By mid November, the picture and story were in syndication and newspapers and magazines across Europe had published them. The story about the groundbreaking fetal surgery was old news and Life Magazine buried their story,”Born Twice” in the last few pages of the December 1999 issue. “It has become an urban legend,” says Bruner, the Vanderbilt University surgeon who fixed the spina bifida lesion on Samuel. Many people he hears from wonder whether it’s a fake. “One person said the photo had been reviewed by a team of medical experts and they had determined that it was a hoax,” Bruner says with a laugh. More commonly, people want to know how the photo came to be. The popularity of the picture and story, through emails, propelled their publication in the June 9th, 2003 issue of Newsweek, four years after the picture was taken. That issue of Newsweek was displayed, to show the picture of Samuel reaching out, during the Partial Birth Abortion debates on the floor of the U.S. Senate, and the House of Representatives. September 25th, 2003, Samuel, his parents, and I testified before a Senate Committee about the surgery and the impact of the picture. Samuel actually answered questions from Senator Sam Brownback. I went on to freelance for eight years after the picture. Please study the three frames that were taken in sequence in the slide show. These frames were taken at 1/60th of a sec. as fast as my Canon 1N motor drive could shoot. The motion blur in the third frame explains what is happening. Watch Dr. Bruner’s fingers, compare the first two frames to the third frame. The doctor’s fingers are blurred because he is shaking them up and down in the third frame. The motion blur on Samuel’s hand transfers to the upper part of his wrist as he grasps the doctor’s finger. Samuel squeezed so tight, he stopped the action in the photograph. He is the reason the picture is in focus. Notice in the third frame, the right side of the surgical opening. The edges are smooth. Now notice above Samuel’s hand. You can see the surgical edge was damaged as Samuel thrust his hand out. Anesthetizing a child in utero is the most experimental aspect of this procedure. Someone please, ask Dr. Joseph P. Bruner if he truly did pose the picture that caused him to lose the cover of Life Magazine? I see people are still commenting on this famous photo. I don’t know if it was a reflex or the baby really was grabbing on to the doctor’s fingers. I do realize that is a human being,a human life there. I hope he is doing well. I understand you are very busy so I don’t expect a reply any time soon. Take care Mugwort. You guys want science? Well read the second to last line over again, “Anesthetizing a child in utero is the most experimental aspect of this procedure.” We do NOT know how to properly administer anesthesia to an unborn child. He probably felt some pain. He probably felt groggy but if they didn’t get the correct and perfect mixture of drugs for him, then yes he could still move. Why don’t you do some research before trying to brush it off because you are just “oh so intellectual”. Sincerely, the nursing student who actually does her research instead of just regurgitating what the media tells you. In reply to sylvie: You say “science is still a fact”. Actually, the word science loosely describes a discipline, or set of disciplines, that tries diligently to base conclusions on facts. However, the reality is that facts can often be misinterpreted. It’s difficult to determine the facts here. Did the anesthesiologist administer a dose that was inadequate to anesthetize Samuel and the hospital is reluctant to admit to this? Getting the correct dose is a difficult and risky procedure which is why they are paid so much. Or did the photographer lie or misinterpret what he saw? I certainly don’t know because I was not there, but the case for the his lying seems the least likely. In any event, this is a remarkable picture of Samuel, who has gone on to lead a fulfilling life after a diagnosis and subsequent surgery that could have ended his life much earlier. Whatever you believe in, science is still a fact and you can prove it. Facts say the baby and mother were under anesthesia during surgery. Anesthesia drugs block movement and sensation. Facts don’t lie and can’t be changed. You can believe anything you want though of course. To God be the Glory,Mt. 19:26″With man this is impossible,but with God all things are possible.”God bless us all. I just want you to know how absolutely amazing I find this picture to be. 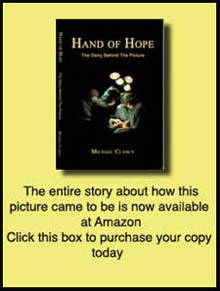 I’m writing an analytical essay of an image, and I’ve chosen your “Hand of Hope.” No matter the grade I get, your image has forever touched my heart. Merry Christmas, Michael. Your photo has touched the world and continues to do so, even into 2014! evidence. Keep doing God’s work and following His plan for you. Peace be with you and Juanita. My preemie son was grasping our fingers from the moment he was born. He was born 21 1/2 weeks gestation. So your Dr and your assumptions are wrong. If my son did not have our fingers he would grasp his breathing tubes and IV’s which the nurses had to literally pry out of his small hands. Also, there are many untrasound pictures of even younger babies in utero grasping their umbilical cords. I could understand from a photographic standpoint the proof of your image, but ultimately, your sincerity of heart is apparent Michael. How sweet of a moment you have captured, it holds so much! The name Samuel means “God has heard”…and so I think He has, as can be seen in the picture, the plea of these little children…”I am here, I am alive, take my hand not my life”…many blessings Michael. Michael, it’s sad to hear what some people will say and do to avoid that awful admission that the we may be committing murder on a bigger scale than Hitler. For if the photo wasn’t staged, then we might have to admit that the “lumps of tissue” we terminate are really people with an inalienable right to life that couldn’t be trumped by the mother’s desire to not give birth. Instead, we’d rather rationalize it all away and say “that didn’t really happen”, because we couldn’t live with ourselves for what we’ve allowed since 1973 if it did. Stand strong, my friend. While this picture is absolutely amazing and touching, I would like to add my own experience…my son was born premature at 31 weeks, weighing just 3lbs. He did not have a grasp reflex for weeks after. It bothered us when we placed our fingers in his palm and he would not close his hand. We asked to speak to the neonatal neurologist and voiced our concern to which he chuckled and told us not to fear, it was something that he has yet to grow into. Sure enough, several weeks later we was grasping. The 24 weekers in our NICU were just over a pound a lot of the time. A 21 weeker would be a mere 10-12 oz. I don’t believe that they would have this grasp reflex at this point in utero. This is an amazing image. Thank you for continuing to speak up for the true story. Like Michael Clancy said, the REAL story behind the picture is very important. In your comment you mentioned ‘…the amazement of life itself.”-is that not important?? I believe that Michael gave the background information for the sake of having background information. If I were to have witnessed a 21 week old baby reach out from his mother’s womb, I wouldn’t stop talking about it or thinking about it either. It is life changing and an amazing occurance! This picture speaks to me. I am a political science major with hopes of doing something worthwhile in politics with regards to Pro- life and sanctity of life. I am using this story and picture in a persuasive speech on abortion tomorrow…and will give birth to my fourth blessing on Monday. Thank you for bringing light to this truth. It’s not hard to see that the baby is very blatantly clasping the surgeon’s finger. Keep standing up for the truth Michael! I don’t know, sounds kinda funny to me. The official recount of the story says that the arm fell out, and the surgeon put it back in, and the surgeon says he pulled the hand out and posed with it for the picture. Someone can’t make up their minds, or get their stories straight. Sorry I didn’t explain that very well. “1/60th is a pretty fast speed for the indoor OR conditions, but can allow sufficient time for perspective changes” exactly. 1/60th is not fast enough to stop any motion – you must hold the camera still during the exposure. “Especially at the zoom level I assume Michael had to be at.” correct again, and this is twofold: 1) long focal length magnifies motion blur from camera instability and 2) at a long focal length the camera has to move farther for the PERSPECTIVE (not field of view) to change. It’s a high school geometry problem. That is why I don’t believe these photos were taken all in sequence within a fraction of a second of each other with the shutter button held down. The first two frames, yes, but the third frame shows a significant shift in the perspective, and there is simply no way you can move the camera that much and still get a sharp image. There would be motion blur from the cameras movement at 1/60th. Jesse, I believe you are the one mixing up the photographer terms. Also, focus and sharpness are different. Though both terms can be redundantly used at times, focus has more to do with focal length, while sharpness is more of an issue of contrast and detail. I believe what Michael refers to is how Baby Samuel’s hand moved from a distance slightly out of focus to a distance perfectly in focus. BTW, Michael, even Snopes is discrediting you (using terrible, unreliable sources at that). That is really just shameful. If the anesthesia had worn off surely that would be a major problem, which they would have had to have taken into consideration, and applied more anesthetic before the operation could be safely completed right? This doesn’t make any sense. I think you are mixing up “in focus” with “sharp,” but the description still doesn’t really math the photographs. Whatever spectrum of religiousness, whatever side of the abortion issue you fall, how can you not look at this picture and feel the overwhelming joy and amazement of life itself. The real story behind this picture is not really even important. Although Michael you have obviously spent a decade obsessed with a story that now reeks of self-promoting variations. Thank you! It’s definitely been an adventure. Michael, after reading your story and looking at the slideshow, I BELIEVE YOU!!! Congratulations for keeping the “fire of life” burning after all these years.